(TOMS RIVER, NJ) -- MidWeek Jazz continues when Stephanie Trick and Paolo Alderighi take the Grunin Center Main Stage on Wednesday, May 16 at 8:00pm. The pair are two of the greatest exponents of classic jazz piano, specializing in the exciting sounds of ragtime, stride, swing, and boogie-woogie. 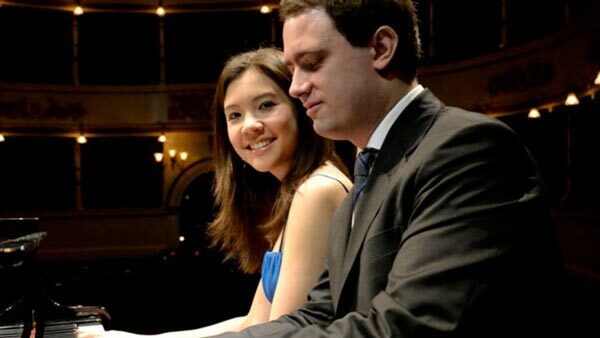 For this special concert, this husband-and-wife team will join forces to play a series of intricate “four hand” duets on a single piano. Purchase tickets online www.grunincenter.org, call 732-255-0500, or visit the Box Office, Mon-Fri,10am-5pm. The Grunin Center is located on the campus of Ocean County College, College Drive, Toms River, NJ. Please use Parking Lot #2. Upcoming MidWeek Jazz Performance: Wed, Jun 20, 8:00pm: The Jazz Lobsters Big Band.